Unfortunately, there are a significant amount of diseases that cause muscle pain and weakness, making it somewhat difficult to know what the reason for this symptom truly is. If your experience is long-term and ongoing you should talk to your doctor in order to obtain a diagnosis; however, oftentimes, muscle weakness can be put down to an unserious, or passing health matter. Below are some of the five most common diseases that cause fatigue and weakness. Feeling tired and suffering from weak muscles is quite often an early sign of a cold or the flu. There are different influenza viruses which are highly contagious, and can spread quickly among all manner of people. Many symptoms include tiredness, weakness, and aching muscles - all of which can present themselves fairly suddenly, and can last from a few days up to two weeks. This disorder involves a malfunction within the immune system, it attacks itself rather than attacking external pollutants. It can often occur after a viral or bacterial infection such as influenza or herpes, and causes damage to nerves which causes a sensation of weakened muscles - often starting in the legs and traveling upwards to the arms. It can encompass the body over just a few hours, or it might take several days. This disease is not yet fully understood, but scientists believe it is due to an imbalance of chemicals in the brain, which interferes with the pain messages between the central nervous system and different parts of the body. It is believed to be caused by either psychological, or physiological causes, and is more common in women than men. Due to the problem regarding pain messages many sufferers experience heightened muscular pain and weakness. There are several different types of MD. Each of them involve the deterioration of skeletal muscles, but differ with regard to the severity of damage, speed of development, and which muscles are affected. All of the disorders can be life-threatening; however, many sufferers experience such difficulties with weakened muscles that they end up wheelchair-bound. MS is another broad disorder which can reveal itself in a multitude of ways, affecting many victims differently. Muscular weakness, pain, and a general feeling of fatigue are common symptoms, which can seem constant or can sometimes materialize unexpectedly. As well as causing weakness, this disease can cause spasms and muscular pain too. It is another autoimmune condition, meaning the immune system attacks itself causing nerve damage. 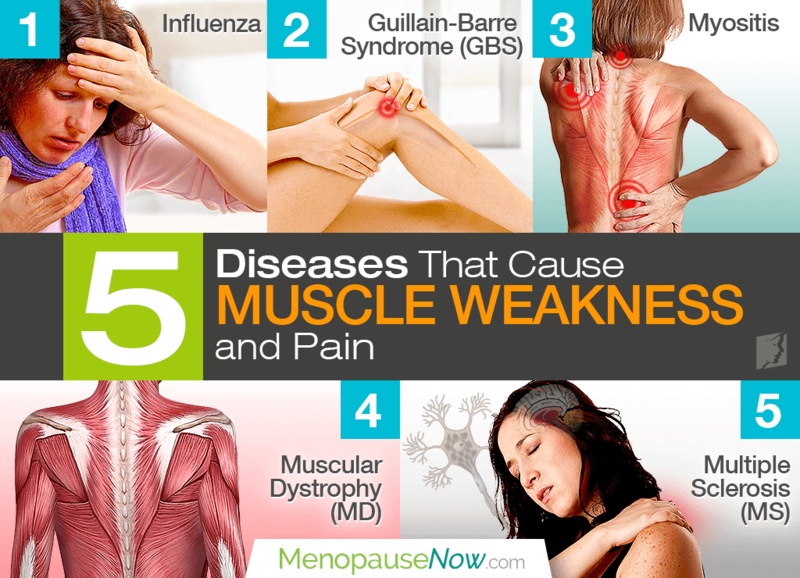 Unfortunately, these are just five of some of the common diseases that cause muscle pain and weakness. If you suffer from this difficulty for an extended period of time, or are finding that problems regarding your muscles are unmanageable, you should talk to your doctor in order to explore the possible reasons for it, and what you can do to alleviate the pain.